John McCain has been dead for over half a year. His death saddened just about every patriotic American with one notable exception: Donald Trump. 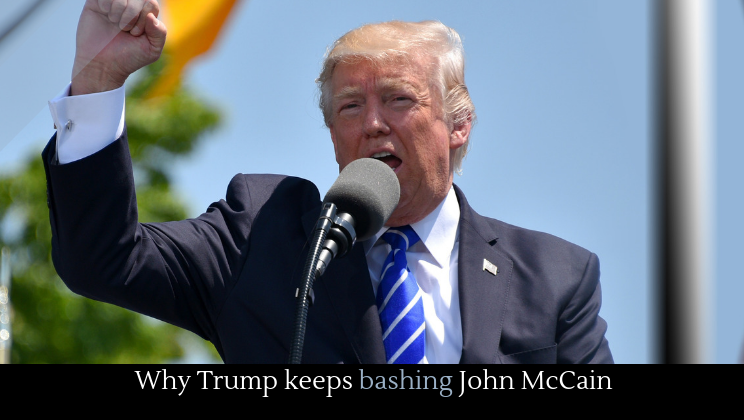 Trump didn’t like McCain then, as he famously said recently, and he doesn’t like McCain now. For the past week, in fact, Trump has been continually attacking the deceased war hero. Why on earth would Trump do this? Trump invents villains to make himself look better. He learned quickly that his fans like it when he insults people, so he finds people to insult. Terrorists, Democrats, Hillary Clinton, immigrants, or in this case John McCain, Trump paints himself and his supporters are living under siege. And there’s another reason that Trump wants to mock McCain now. Trump knows that he can never go too far because he’s already stretched the limit of public acceptance. So he can attack someone like McCain just to stir the pot and to distract people from what’s really going on––things like the imminent Mueller report. JOHN McCAIN WAS SOOOO MUCH SMARTER **AND A WAR HERO** THAN F’CKIN’ TRUMPh!! Prepping for Mueller report where f’ckin’ Tr-humph/Kiss’up’nerd hopefully are INDICTED FOR FRAUD!